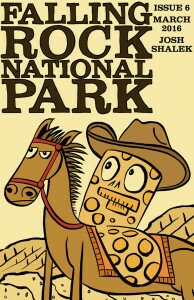 Falling Rock National Park #6 is at the printer right now, being printed! Real ink is being laid down on real paper, and when the process has completed I will have in my hands 500 copies of the greatest detective story ever told! Want to know who is the culprit? You’ll have to read it yourself to find out. Subscribers have already been emailed, and I will be taking preorders for this issue at my Buy Books page. If you live in Los Angeles, I hope to see you at WonderCon! March 25-27. I’m exhibiting at Small Press table 93. I’ll have #6, as well as previous issues, Tomb of the Zombies and Jack Ketch, prints, and maybe even a special surprise (involving dinosaurs).